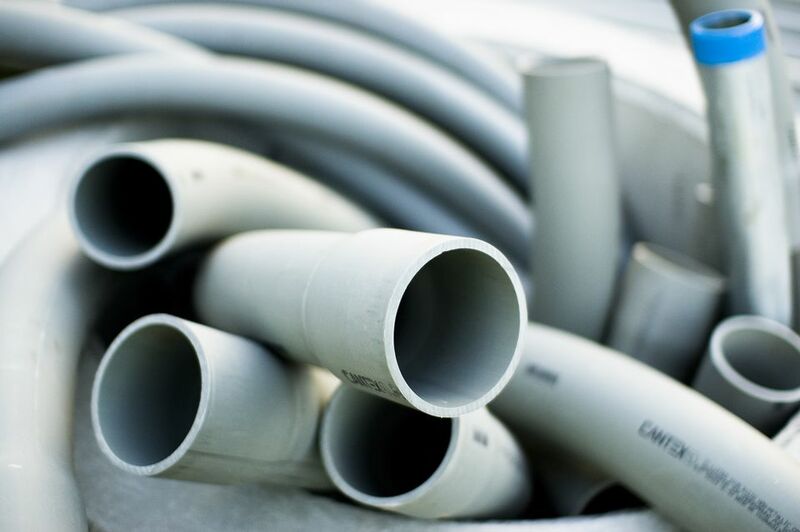 If you've never pulled wire through conduit, it may seem a bit troubling. How in the world can you get wire to push through conduit, especially when the conduit run may be hundreds of feet long? Unless the conduit is very short and/or perfectly straight, pushing it through is highly unlikely. And, of course, it won't just crawl through the pipe itself. Dry and bare wiring being pulled through conduit, especially PVC conduit, creates friction, making it even more difficult to pull the wire. There are a few basic tools and supplies that can help make pulling wire through conduit a snap. And it's always easier to pull wires with a partner. Most wire that is installed in conduit is insulated wire (usually THHN or THWN) rather than sheathed cable, such as non-metallic (NM), or Romex, cable. Running NM cable inside conduit is not a standard practice and may not be allowed in all jurisdictions. The National Electrical Code (NEC) does not prohibit running NM cable inside conduit, but this installation is subject to conduit fill limits, just like insulated wire in conduit. Because NM cable takes up more space than individual wires, it's easier to exceed the fill limit with cable. Also, cable is difficult to pull through conduit, due to the cable's size and the sheathing, so running cable in conduit typically is limited to very short runs that do not require standard wire pulling techniques. Also note that NM cable is not rated for outdoor, or wet, applications. It is never permissible to run NM cable outdoors or in other wet areas, even if the cable is installed in conduit. Pulling wires can be difficult enough through straight runs of conduit, but throwing a few bends and turns in the run increases friction, making pulling much more difficult. That's when you use a lubricant. Wire-pulling compound is a non-conductive lubricant in either a gel or a slimy, soapy form that makes both the conduit and wires slick by coating the wiring, allowing it to slide through the conduit with relative ease. Apply compound directly to the wires before pulling them into the conduit. Use the lubricant more heavily at the beginning of the pull and less so toward the end of the pull, as the interior of the conduit will become coated along its length as you pull. Follow the manufacturer's instructions for proper application. A conduit mouse, also called a conduit piston, is a small cylinder of foam that is slightly smaller than the interior diameter of the conduit. You use it with a shop vacuum. Tie a strong string, called a pull string, to the loop on the wire running through the mouse. Insert the mouse into the conduit on the end that is opposite to the end you will pull from. The mouse goes in first, followed by the string. Fit the hose of a shop vac over the other end of the conduit, and turn on the vacuum until the mouse is sucked all the way to that end, then turn off the vacuum. Pull the mouse out of the conduit and untie the string from the wire loop. Secure the string to the wires, and lubricate the wires, as needed. Feed the wires into the conduit while your partner pulls them from the other end, using the string. The most commonly used tool for pulling wire through conduit is a fish tape, an electrician's tool with a long, flat metal wire wound inside a wheel-shaped spool. Fish tapes are widely available in a range of lengths starting at 25 feet. There are also nylon tapes that don't include a spool; these may be the most economical option for when you need a fish tape only for small jobs. Feed the end of the tape, which has a hook on it, into the same end of the conduit that you will pull from. Push the tape through the conduit, unwinding from the spool as you go. Stop feeding when the hook end emerges from the opposite end of the conduit. Strip insulation from the end of each wire, using wire strippers. Strip each wire a different amount. For example, if there are three wires, strip one about 6 inches, one about 4 inches, and one about 2 inches. Hold the three wires together so their insulation is aligned. Grab all three with linesman's pliers and twist their bare ends together. Bend the longest wire into a hook and loop it through the hook of the fish tape, then wrap the loop closed. Wrap the fish tape hook and the bare wire ends with electrical tape. Apply lubricant to the tape, if desired. Feed the wires into the conduit while your partner pulls them through from the other end by pulling on the fish tape.